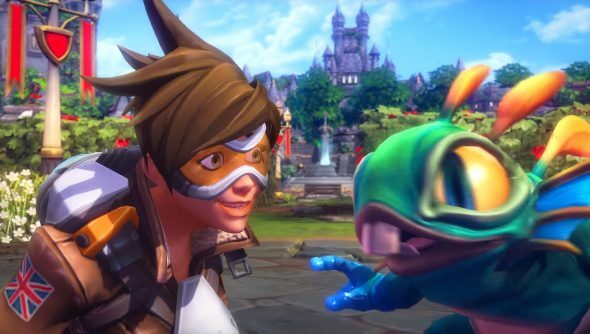 Heroes of the Storm’s latest update is live now, bringing with it the usual suspects of balance changes, bug fixes and new things to buy in the shop. There’s also something special for folk who were seduced into pre-ordering the digital version of Overwatch: Origins Edition on Battle.net. It’s Tracer’s debut, you know the one, the one with the bum. Is it weird that Blizzard’s adding characters from unreleased games when there’s still a whole bunch of Warcraft, StarCraft and Diablo heroes to choose from? It absolutely is, but her abilities sounds nifty so all is forgiven. Lob a short-range bomb that will adhere to the terrain or the first enemy it hits. The bomb explodes after 1.5 seconds, dealing heavy damage to an enemy caught at the center of the blast, and half-damage to enemies nearby. If you aren’t getting her as a pre-order bonus for Overwatch, then you’ll need to wait until April 26. That’s when she’ll appear in the shop. As well as the arrival of Tracer, there have been changes to matchmaking, the UI, new bundles and skins in the shop, battleground tweaks and bug fixes. Check out the full patch notes for more.